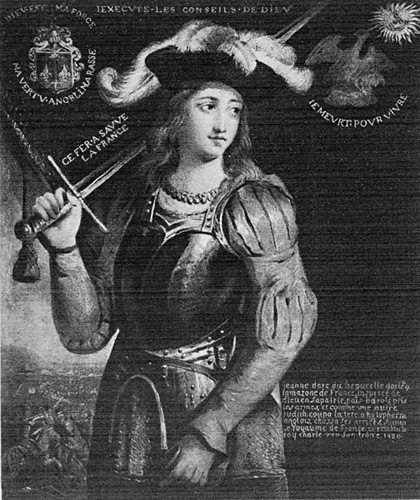 ON the 27th of June, the vanguard, commanded by Marshal de Boussac, the Sire de Rais, the Captains La Hire and Poton, set out from Gien in the direction of Montargis with the design of pressing on to Sens, which, so they had been wrongly informed, was deemed likely to open its gates to the Dauphin. But, at the news that the town had hoisted the flag of St. Andrew, as a sign of fidelity to the English and Burgundians, the army changed its route, so little did it desire to take towns by force. The march was now directed towards Auxerre, where a more favourable reception was expected. The Maid in her impatience had not waited for the King. She rode with the company which had started first. Had she been its leader she would not have turned from a town when its cannon were directed against her. The King set forth two days later, with the Princes of the Blood, many knights, the main battle, as it was called, and the Sire de la Trémouille, who commanded the expedition. All these troops arrived[Pg i.404] before Auxerre on the 1st of July. There on the hill-slope, encircled with vineyards and cornfields, rose the ramparts, towers, roofs, and belfries of the blessed Bishop Germain's city. That town towards which in the summer sunshine, in the company of gallant knighthood, she was now riding, fully armed like a handsome Saint Maurice, Jeanne had seen only three months before, under a dark and cloudy sky; then, clad like a stable-boy, in the company of two or three poor soldiers of fortune, she was travelling over a bad road, on her way to the Dauphin Charles. Since 1424 the County of Auxerre had belonged to the Duke of Burgundy, upon whom it had been bestowed by the Regent. The Duke governed it through a bailie and a captain. The lord Bishop, Messire Jean de Corbie, formerly Bishop of Mende, was thought to be on the Dauphin's side. The Chapter of the Cathedral on the other hand held to Burgundy. Twelve jurors, elected by the burgesses and other townsfolk, administered the affairs of the city. One can easily imagine that fear must have been the dominant sentiment in their hearts when they saw the royal army approaching. Men-at-arms, no matter whether they wore the white cross or the red, inspired all town[Pg i.405] dwellers with a well-grounded terror. And, in order to turn from their gates these violent and murderous thieves, the townsfolk were capable of resorting to the strongest measures, even to that of putting their hands in their purses. The royal heralds summoned the people of Auxerre to receive the King as their natural and lawful lord. Such a summons, backed by lances, placed them in a very embarrassing position. Alike by refusing and by consenting these good folk ran great risk. To transfer their allegiance was no light matter; their lives and their goods were involved. Foreseeing this danger, and conscious of their weakness, they had entered into a league with the cities of Champagne. The object of the league was to relieve its members from the burden of receiving men-at-arms and the peril of having two hostile masters. Certain of the townsfolk therefore presented themselves before King Charles and promised him such submission as should be accorded by the towns of Troyes, Châlons, and Reims. This was not obedience, neither was it rebellion. Negotiations were begun; ambassadors went from the town to the camp and from the camp to the town. Finally the confederates, who were not lacking in intelligence, proposed an acceptable compromise,—one that princes were constantly concluding with each other, to wit, a truce. They said to the King: "We entreat and request you to pass on, and we ask you to agree to refrain from fighting." And, in order to secure their request[Pg i.406] being granted, they gave two thousand crowns to the Sire de la Trémouille, who, it is said, kept them without a blush. Further, the townsfolk undertook to revictual the army in return for money down; and that was worth considering, for there was famine in the camp. This truce by no means pleased the men-at-arms, who thereby lost a fine opportunity for robbery and pillage. Murmurs arose; many lords and captains said that it would not be difficult to take the town, and that its capture should have been attempted. The Maid, who was always receiving promises of victory from her Voices, never ceased calling the soldiers to arms. Unaffected by any of these things, the King concluded the proposed truce; for he cared not by force of arms to obtain more than could be compassed by peaceful methods. Had he attacked the town he might have taken it and held it in his mercy; but it would have meant certain pillage, murder, burning, and ravishing. On his heels would have come the Burgundians, and there would have been plundering, burning, ravishing, massacring over again. How many examples had there not been already of unhappy towns captured and then lost almost immediately, devastated by the French, devastated by the English and the Burgundians, when each citizen kept in his coffer a red cap and a white cap, which he wore in turns! Was there to be no end to these massacres and abominations, resentment against which caused the Armagnacs to be cursed throughout[Pg i.407] l'Île de France, and which made it so hard for the lawful King to recover his town of Paris. The royal Council thought the time had come to put an end to these things. It was of opinion that Charles of Valois would the more easily reconquer his inheritance if, while manifesting his power, he showed himself lenient and exercised royal clemency, as in arms and yet pursuing peace, he continued his march to Reims. After having spent three days under the walls of the town, the army being refreshed, crossed the Yonne and came to the town of Saint-Florentin, which straightway submitted to the King. On the 4th of July, they reached the village of Saint-Phal, four hours' journey from Troyes. In this strong town there was a garrison of between five and six hundred men at the most. A bailie, Messire Jean de Dinteville, two captains, the Sires de Rochefort and de Plancy, commanded in the town for King Henry and for the Duke of Burgundy. Troyes was a manufacturing town; the source of its wealth was the cloth manufacture. True, this industry had[Pg i.408] long been declining through competition and the removal of markets; its ruin was being precipitated by the general poverty and the insecurity of the roads. Nevertheless the cloth workers' guild maintained its importance and sent a number of magistrates to the Council. In 1420, these merchants had sworn to the treaty which promised the French crown to the House of Lancaster; they were then at the mercy of English and Burgundians. For the holding of those great fairs, to which they took their cloth, they must needs live at peace with their Burgundian neighbours, and if the Godons had closed the ports of the Seine against their bales, they would have died of hunger. Wherefore the notables of the town had turned English, which did not mean that they would always remain English. Within the last few weeks great changes had taken place in the kingdom; and the Gilles Laiguisés, the Hennequins, the Jouvenels did not pride themselves on remaining unchanged amidst vicissitudes of fortune which were transferring the power from one side to the other. The French victories gave them food for reflection. Along the banks of the streams, which wound through the city, there were weavers, dyers, curriers who were Burgundian at heart. As for the Churchmen, if they were thrilled by no love for the Armagnacs, they felt none the less that King Charles was sent to them by a special dispensation of divine providence. The Bishop of Troyes was my lord Jean Laiguisé, son of Master Huet Laiguisé, one of the first to swear[Pg i.409] to the treaty of 1420. The Chapter had elected him without waiting for the permission of the Regent, who declared against the election, not that he disliked the new pontiff; Messire Jean Laiguisé had sucked hatred of the Armagnacs and respect for the Rose of Lancaster from his alma mater of Paris. But my Lord of Bedford could not forgive any slighting of his sovereign rights. Shortly afterwards he incurred the censure of the whole Church of France and was judged by the bishops worse than the cruellest tyrants of Scripture—Pharaoh, Nebuchadnezzar, Artaxerxes—who, when they chastised Israel had spared the Levites. More wicked than they and more sacrilegious, my Lord of Bedford threatened the privileges of the Gallican Church, when, on behalf of the Holy See, he robbed the bishops of their patronage, levied a double tithe on the French clergy, and commanded churchmen to surrender to him the contributions they had been receiving for forty years. That he was acting with the Pope's consent made his conduct none the less execrable in the eyes of the French bishops. The episcopal lords resolved to appeal from a Pope ill informed to one with wider knowledge; for they held the authority of the Bishop of Rome to be insignificant in comparison with the authority of the Council. They groaned: the abomination of desolation was laying waste Christian Gaul. In order to pacify the Church of France thus roused against him, my lord[Pg i.410] of Bedford convoked at Paris the bishops of the ecclesiastical province of Sens, which included the dioceses of Paris, Troyes, Auxerre, Nevers, Meaux, Chartres, and Orléans. Messire Jean Laiguisé attended this Convocation. The Synod was held at Paris, in the Priory of Saint-Eloi, under the presidency of the Archbishop, from the 1st of March till the 23rd of April, 1429. The assembled bishops represented to my Lord the Regent the sorry plight of the ecclesiastical lords: the peasants, pillaged by soldiers, no longer paid their dues; the lands of the Church were lying waste; divine service had ceased to be held because there was no money with which to support public worship. Unanimously they refused to pay the Pope and the Regent the double tithe; and they threatened to appeal from the Pope to the Council. As for despoiling the clergy of all the contributions they had received during the last forty years, that, they declared, would be impious; and with great charity they reminded my Lord of Bedford of the fate reserved by God's judgment for the impious even in this world. "The Prince," they said, "should beware of the miseries and sorrows already fallen upon a multitude of princes, who with such demands had oppressed the Church which God redeemed with his own precious blood: some had perished by the sword, some had been driven into exile, others had been despoiled of their illustrious sovereignties. Wherefore such as set themselves to enslave the Church, the Bride of[Pg i.411] God, may not hope to deserve the grace of his divine Majesty." Jean Laiguisé's sentiments towards the English Regent were those of the Synod. It would be wrong, however, to conclude that the Bishop of Troyes desired the death of the sinner, or even that he was hostile to the English. The Church is usually capable of temporising with the powers of this world. Wide is her mercy, and great her longsuffering. She threatens oft before striking and receives the repentance of the sinner at the first sign of contrition. But we may believe that if Charles of Valois were to win the power and show the will to protect the Church of France, the Lord Bishop and the Chapter of Troyes would fear lest if they resisted him they might be resisting God himself, since all power comes from God who deposuit potentes. King Charles had not ventured to enter Champagne without taking measures for his safety; he knew on what he could rely in the town of Troyes. He had received information and promises; he maintained secret relations with several burgesses of the city, and those none of the least. During the first fortnight of May, a royal notary, ten clerks and leading merchants, on their way to the king, were arrested just outside the walls, on the Paris road, by the Sire de Chateauvillain, a captain in the English service. This mission was probably fulfilled by others more fortunate. It is easy to divine what questions were discussed at these audiences. The merchants[Pg i.412] would ask whether Charles, if he became their Lord, would guarantee absolute freedom to their trade; the clerks would ask his promise to respect the goods of the Church. And the King doubtless was not sparing of his pledges. The Maid, with one division of the army, halted before the stronghold of Saint-Phal, belonging to Philibert de Vaudrey, commander of the town of Tonnerre, in the service of the Duke of Burgundy. In that place of Saint-Phal, Jeanne beheld approaching her a Franciscan friar, who was crossing himself and sprinkling holy water, for he feared lest she were the devil, and dared not draw near without having first exorcised the evil spirit. It was Friar Richard who was coming from Troyes. It will be interesting to see who this monk was as far as we can tell. The place of his birth is unknown. A disciple of Brother Vincent Ferrier and of Brother Bernardino of Sienna, like them, he taught the imminent coming of Antichrist and the salvation of the faithful by the adoration of the holy name of Jesus. After having[Pg i.413] been on a pilgrimage to Jerusalem, he returned to France, and preached at Troyes, during the Advent of 1428. Advent, sometimes called Saint Martin's Lent, begins on the Sunday which falls between the 27th of November and the 3rd of December. It lasts four weeks, which Christians spend in making themselves ready to celebrate the mystery of the Nativity. "Sow, sow your seed, my good folk," he said. "Sow beans ready for the harvest, for He who is to come will come quickly." By beans he meant the good works to be performed before Our Lord should come in the clouds to judge the quick and the dead. Now it was important to sow those good works quickly, for the harvest-tide was drawing nigh. The coming of Antichrist was but shortly to precede the end of the world and the consummation of the ages. In the month of April, 1429, Friar Richard went to Paris; the Synod of the Province of Sens was then holding its final session. It is possible that the good Friar was summoned to the great city by the Bishop of Troyes who was present at the Synod; but at any rate it would appear that it was not the rights of the Gallican Church the wandering monk went there to defend. On the 16th of April, he preached his first sermon at Sainte-Geneviève; on the next and the following days, until Sunday, the 24th, he preached every morning, from five until ten or eleven o'clock, in the open air, on a platform, erected against the charnel-house of the Innocents, on the spot whereon was celebrated the dance of death. Around the platform, about nine feet high, there crowded five or six thousand[Pg i.414] persons, to whom he announced the speedy coming of Antichrist and the end of the world. "In Syria," he said, "I met bands of Jews; I asked them whither they were going, and they replied: 'We are wending in a multitude towards Babylon, for of a truth the Messiah is born among men, and he will restore unto us our inheritance, and he will bring us again to the land of promise.' Thus spake those Syrian Jews. Now Scripture teaches us that He, whom they call the Messiah, is in truth that Antichrist, of whom it is said he shall be born in Babylon, capital of the kingdom of Persia, he shall be brought up at Bethsaida and in his youth he shall dwell at Chorazin. Wherefore our Lord said: 'Woe unto thee, Chorazin! woe unto thee, Bethsaida.' The year 1430," added Friar Richard, "shall witness greater marvels than have ever been seen before. The time draweth nigh. He is born, the man of sin, the child of perdition, the wicked one, the beast vomited forth from the abyss, the abomination of desolation; he came out of the tribe of Dan, of whom it is written: 'Dan shall be a serpent by the way, an adder in the path.' Soon shall return to the earth the prophets Elijah and Enoch, Moses, Jeremiah and Saint John the Evangelist; and soon shall dawn that day of wrath which shall grind the age in a mill and beat it in a mortar, according to the testimony of David and the Sibyl." Then the good Brother concluded by calling upon them to repent, to do penance and to renounce empty riches. In short, in the opinion of the clerks, he was a man of worship and an orator. His sermons produced more devoutness among the people, it was[Pg i.415] thought, than those of all the sermonizers who for the last century had been preaching in the town. And it was time that he came, for in those days the folk of Paris were greatly addicted to games of chance; yea, even priests unblushingly indulged in them, and seven years before, a canon of Saint-Merry, a great lover of dice was known to have gamed in his own house. Despite war and famine, the women of Paris loaded themselves with ornaments. They troubled more about their beauty than about the salvation of their souls. Friar Richard thundered most loudly against the draught boards of the men and the ornaments of the women. One day notably, when he was preaching at Boulogne-la-Petite, he cried down dice and hennins, and spoke with such power that the hearts of those who listened were changed. On returning to their homes, the citizens threw into the streets gaming-tables, draught-boards, cards, billiard cues and balls, dice and dice-boxes, and made great fires before their doors. More than one hundred of these fires continued burning in the streets for three or four hours. Women followed the good example set by the men that day, and the next they burnt in public their head-dresses, pads, ornaments, and the pieces of leather or whalebone on which they mounted the fronts of their hoods. Young misses threw off their horns and their tails, ashamed to clothe themselves in the devil's garb. The good Brother likewise caused to be burnt the mandrake roots which many folk kept in their[Pg i.416] houses. Those roots are sometimes in the form of an ugly little man, of a curious and devilish aspect. On that account possibly, singular virtues are attributed to them. These mannikins were dressed in fine linen and silk and were kept in the belief that they would bring good luck and procure wealth. Witches made much of them; and those who believed that the Maid was a witch accused her of carrying a mandrake on her person. Friar Richard hated these magic roots all the more strongly because he believed in their power of attracting wealth, the root of all evil. Once again his word was obeyed; and many a Parisian threw away his mandrake in horror, albeit he had bought it dear from some old wife who knew more than was good for her. Friar Richard caused the Parisians to replace these evil treasures by objects of greater edification,—pewter medals, on which was stamped the name of Jesus, to the worship of whom he was especially devoted. Having preached ten times in the town and once in the village of Boulogne, the good Brother announced his return to Burgundy and took his leave of the Parisians. "I will pray for you," he said; "pray for me. Amen." Whereupon all the folk, high and lowly, wept bitterly and copiously, as if each one were bearing to the grave his dearest friend. He wept with them and consented to delay his departure for a little. On Sunday, the 1st of May, he was to preach to the devout Parisians for the last time. Montmartre, the very spot where Saint Denis had suffered martyrdom, was the place chosen for the meeting of the faithful. In those unhappy days the hill was well-nigh uninhabited. But on the evening before that day more than six thousand people flocked to the mount to be certain of having good places; and there they passed the night, some in deserted hovels, but the majority in the open, under the stars. When the morning came no Friar Richard appeared, and in vain they waited for him. Disappointed and sad, at length they learnt that the Friar had been forbidden to preach. He had said nothing in his sermons to offend the English. The Parisians who had heard him believed him to be a good friend to the Regent and to the Duke of Burgundy. Perhaps he had taken flight owing to a report that the theologians of the University intended to proceed against him. His views concerning the end of the world were indeed both singular and dangerous. Friar Richard had gone off to Auxerre. Thence he went preaching through Burgundy and Champagne. If he was on the King's side he did not let it appear. For in the month of June the folk of Champagne, and the inhabitants of Châlons especially, deemed him a worthy man and attached to the Duke of Burgundy. And we have seen that on the 4th of[Pg i.418] July he suspected the Maid of being either the devil or possessed by a devil. She understood. When she saw the good Brother crossing himself and sprinkling holy water she knew that he took her for something evil,—for a phantom fashioned by the spirit of wickedness, or at least for a witch. However, she was by no means offended as she had been by the suspicions of Messire Jean Fournier. The priest, to whom she had confessed, could not be forgiven for having doubted whether she were a good Christian. But Friar Richard did not know her, had never seen her. Besides, she was growing accustomed to such treatment. The Constable, Brother Yves Milbeau, and many others who came to her asked whether she were from God or the devil. It was without a trace of anger, although in a slightly ironical tone, that she said to the preacher: "Approach boldly, I shall not fly away." Meanwhile Friar Richard, by the ordeal of holy water and by the sign of the cross, had proved that the damsel was not a devil and that there was no devil in her. And when she said she had come from God he believed her with all his heart and esteemed her an angel of the Lord. He confided to her the reason for his coming. The inhabitants of Troyes doubted whether she were of God; to resolve their doubts he had come to Saint-Phal. Now he knew she was of God, and he was not[Pg i.419] amazed; for he knew that the year 1430 would witness greater marvels than had ever been seen before, and one day or other he was expecting to behold the Prophet Elias walking and conversing with men. From that moment he threw in his lot with the party of the Maid and the Dauphin. It was not the Maid's prophecies concerning the realm of France that attracted him to her. The world was too near its end for him to take any interest in the re-establishment of the madman's son in his inheritance. But he expected that once the kingdom of Jesus Christ had been established in the Land of the Lilies, Jeanne, the prophetess, and Charles, the temporal vicar of Jesus Christ, would lead the people of Christendom to deliver the Holy Sepulchre. That would be a meritorious work and one which must be accomplished before the consummation of the ages. Good friends and beloved, an it please you, ye lords, burgesses and inhabitants of the town of Troies, Jehanne the Maid doth call upon and make known unto you on behalf of the King of Heaven, her sovereign and liege Lord, in whose service royal she is every day, that ye[Pg i.420] render true obedience and fealty to the Fair King of France. Whosoever may come against him, he shall shortly be in Reins and in Paris, and in his good towns of his holy kingdom, with the aid of King Jhesus. Ye loyal Frenchmen, come forth to King Charles and fail him not. And if ye come have no fear for your bodies nor for your goods. An if ye come not, I promise you and on your lives I maintain it, that with God's help we shall enter into all the towns of the holy kingdom and shall there establish peace, whosoever may oppose us. To God I commend you. God keep you if it be his will. Answer speedily. Before the city of Troyes, written at Saint-Fale, Tuesday the fourth day of July. "To the lords and burgesses of the city of Troyes." The Maid gave this letter to Friar Richard, who undertook to carry it to the townsfolk. "This day do we expect the enemies of King Henry and the Duke of Burgundy who come to besiege us. In view of the design of these our foes and having considered the just cause we support and the aid of our princes promised unto us, we have resolved in council, no matter what may be the strength of our enemies, to continue in our obedience waxing ever greater to King Henry and[Pg i.421] to the Duke of Burgundy, even until death. And this have we sworn on the precious body of Our Lord Jesus Christ. Wherefore we pray the citizens of Reims to take thought for us as brethren and loyal friends, and to send to my Lord the Regent and the Duke of Burgundy to beseech and entreat them to take pity on their poor subjects and come to their succour." On that same day, in the morning, from his lodging at Brinion-l'Archevêque, King Charles despatched his heralds bearing closed letters, signed by his hand, sealed with his seal, addressed to the members of the Council of the town of Troyes. Therein he made known unto them that by the advice of his Council, he had undertaken to go to Reims, there to receive his anointing, that his intention was to enter the city of Troyes on the morrow, wherefore he summoned and commanded them to render the obedience they owed him and prepare to receive him. He wisely made a point of reassuring them as to his intentions, which were not to avenge the past. Such was not his will, he said, but let them comport themselves towards their sovereign as they ought, and he would forget all and maintain them in his favour. "The lords, knights and squires who are in the town, on behalf of King Henry and the Duke of[Pg i.422] Burgundy, have sworn with us, inhabitants of the city, that we will not receive into the town any who are stronger than we, without the express command of the Duke of Burgundy. Having regard to their oath, those who are in the town would not dare to admit King Charles." "Whatever we the citizens may wish we must consider the men of war in the city who are stronger than we." The councillors had King Charles' letter posted up and below it their reply. In council they read the letter the Maid had dictated at Saint-Phal and entrusted to Friar Richard. The monk had not prepared them to give it a favourable reception, for they laughed at it heartily. "There is no rhyme or reason in it," they said. "'Tis but a jest." They threw it in the fire without sending a reply. Jeanne was a braggart, they said. And they added: "We certify her to be mad and possessed of the devil." That same day, at nine o'clock in the morning, the army began to march by the walls and take up its position round the town. Those who encamped to the south west could thence[Pg i.423] admire the long walls, the strong gates, the high towers and the belfry of the city rising in the midst of a vast plain. On their right they would see above the roofs the church of Saint-Pierre, the huge structure of which was devoid of tower and steeple. It was there that eight years before had been celebrated the betrothal of King Henry V of England to the Lady Catherine of France. For in that town of Troyes, Queen Ysabeau and Duke Jean had made King Charles VI, bereft of sense and memory, sign away the Kingdom of the Lilies to the King of England and put his name to the ruin of Charles of Valois. At her daughter's betrothal, Madame Ysabeau was present wearing a robe of blue silk damask and a coat of black velvet lined with the skins of fifteen hundred minevers. After the ceremony she caused to be brought for her entertainment her singing birds, goldfinches, chaffinches, siskins and linnets. When the French arrived, most of the townsfolk were on the ramparts looking more curious than hostile and apparently fearing nothing. They desired above all things to see the King. The town was strongly defended. The Duke of[Pg i.424] Burgundy had long been keeping up the fortifications. In 1417 and 1419 the people of Troyes, like those of Orléans in 1428, had pulled down their suburbs and destroyed all the houses outside the town for two or three hundred paces from the ramparts. The arsenal was well furnished; the stores overflowed with victuals; but the Anglo-Burgundian garrison amounted only to between five and six hundred men. On that day also, at five o'clock in the afternoon, the Councillors of the town of Troyes sent to inform the people of Reims of the arrival of the Armagnacs, and despatched to them copies of the letter from Charles of Valois, of their reply to it and of the Maid's letter, which they cannot therefore have burned immediately. They likewise communicated to them their resolution to resist to the death in case they should receive succour. In like manner they wrote to the people of Châlons to tell them of the Dauphin's coming; and to them they made known that the letter of Jeanne the Maid had been brought to Troyes by Friar Richard the preacher. These writings amounted to saying: like all citizens in such circumstances, we are in danger of being hanged either by the Burgundians or by the Armagnacs, which would be very grievous. To avoid this calamity as far as in us lies, we give King Charles of Valois to understand that we do not open our gates to him because the garrison prevents us and that we are[Pg i.425] the weaker, which is true. And we make known to our Lords, the Regent and the Duke of Burgundy, that the garrison being too weak to defend us, which is true, we ask for succour, which is loyal; and we trust that the succour will not be sent, for if it were we should have to endure a siege, and risk being taken by assault which for us merchants would be grievous. But, having asked for succour and not receiving it, we may then surrender without reproach. The important point is to cause the garrison, fortunately a small one, to make off. Five hundred men are too few for defence, but too many for surrender. As for enjoining the citizens of Reims to demand succour for themselves and for us, that is merely to prove our good-will to the Duke of Burgundy; and we risk nothing by it, for we know that our trusty comrades of Reims will take care that when they ask for succour they do not receive it, and that they will await a favourable opportunity for opening their gates to King Charles, who comes with a strong army. And now to conclude, we will resist to the death if we are succoured, which God forbid! Such were the crafty thoughts of those dwellers in Champagne. The citizens fired a few stone bullets on to the French. The garrison skirmished awhile and returned into the town. Meanwhile King Charles' army was stricken with famine. The Archbishop of Embrun's counsel to provide the army with victuals by means of human wisdom was easier to give than to follow. There were between six and seven thousand men in camp[Pg i.426] who had not broken bread for a week. The men-at-arms were reduced to feeding on pounded ears of corn still green and on the new beans they found in abundance. Then they called to mind how during Saint Martin's Lent Friar Richard had said to the folk of Troyes: "Sow beans broadcast: He who is to come shall come shortly." What the good brother had said of the spiritual seed-time was interpreted literally: by a curious misunderstanding, what had been uttered concerning the coming of the Messiah was applied to the coming of King Charles. Friar Richard was held to be the prophet of the Armagnacs and the men-at-arms really believed that this evangelical preacher had caused the beans they gathered to grow; thus had he provided for their nourishment by his excellence, his wisdom and his penetration into the counsels of God, who gave manna unto the people of Israel in the desert. The King, who had been lodging at Brinion since the 4th of July, arrived before Troyes in the afternoon of Friday the 8th. That very day he held council of war with the commanders and princes of the blood to decide whether they should remain before the town until by dint of promises or threats they obtained its submission, or whether they should pass on, leaving it to itself, as they had done at Auxerre. "Fair Dauphin," said she, "command your men to attack the town of Troyes and delay no further in councils too prolonged, for, in God's name, before three days, I will cause you to enter the town, which shall be yours by love or by force and courage. And false Burgundy shall look right foolish." Wherefore had they contrary to their custom summoned her to the Council? It was merely a question of firing a few cannon balls and pretending to scale the walls, in short, of making a false attack. Such a feigned assault was due to the people of Troyes, who could not decently surrender save to some display of force; and besides the lower orders must be frightened, for they remained at heart Burgundian. Probably my Lord of Trèves or another judged that the little Saint by appearing beneath the ramparts of Troyes would strike a religious terror into the weavers of the city. They had only to leave her to go her own way. The Council over, she mounted her horse, and lance in hand hurried to the moat, followed by a crowd of knights, squires, and craftsmen. The point of attack was to be the north west wall, between the Madeleine and the Comporté Gates. Jeanne, who firmly be[Pg i.428]lieved that the town would be taken by her, spent the night inciting her people to bring faggots and put the artillery in position. "To the assault," she cried, and signed to them to throw hurdles into the trenches. This threat had the desired effect. The lower orders, imagining the town already taken, and expecting the French to come to pillage, massacre and ravish, as was the custom, took refuge in the churches. As for the clerics and notables, this was just what they wanted. Being assured by Charles of Valois that they might come to him in safety, the Lord Bishop Jean Laiguisé, my Lord Guillaume Andouillette, Master of the Hospital, the Dean of the Chapter, the clergy and the notables went to the King. Jean Laiguisé was the spokesman. He came to do homage to the King and to offer excuse for the townsfolk. It is not their fault, he said, if the King enter not according to his good pleasure. The Bailie and those of the garrison, some three or four hundred, guard the gates, and forbid their being opened. Let it please the King to have patience until I have spoken to those of the town. I trust that as soon as I have spoken to them, they will open the gates and render the King such obedience as he shall be pleased withal. In replying to the Bishop, the King set forth the[Pg i.429] reasons for the expedition and the rights he held over the town of Troyes. Without exception, he said, I will forgive all the deeds of past times, and, according to the example of Saint Louis, I will maintain the people of Troyes in peace and liberty. Jean Laiguisé demanded that such revenues and patronage as had been bestowed on churchmen by the late King, Charles VI, should be retained by them, and that those who had received the same from King Henry of England should be given charters by King Charles authorizing them to keep their benefices, even in cases where the King had bestowed them on others. "Thus," they said, "we shall have the same lord over us. You will keep your lives and your goods, as we have done. For otherwise we should all be lost. We do not regret our submission. Our only grief is that we delayed so long. You will be right glad to follow our example; for King Charles is a prince of greater discretion, understanding and valour than any who for many a long year have arisen in the noble house of France." Friar Richard went to find the Maid. As soon as he saw her, and when he was still afar off, he knelt before her. When she saw him, she likewise knelt before him, and they bowed low to each other. When he returned to the town, the good Friar preached to the folks at length and exhorted them to obey King Charles. "God is preparing his way," he said. "To accompany him and to lead him to his anointing God hath sent him a holy Maid, who, as I firmly believe, is as able to penetrate the mysteries of God as any saint in Paradise, save Saint John the Evangelist." The good Brother found himself obliged to recognise as superior to Jeanne at least one saint,—one who was the first of saints, the apostle who had lain with his head on Jesus' breast, the prophet who was ere long to return to earth, when the ages should have been consummated. "If she wished," continued Friar Richard, "she could bring in all the King's men-at-arms, over the walls or in any other manner that pleased her. And many other things can she do." The townsfolk had great faith and confidence in this good Brother who spoke so eloquently. What he[Pg i.431] said of the Maid appeared to them admirable, and won their obedience to a king so powerfully accompanied. With one voice they all cried aloud, "Long live King Charles of France!" But now it was necessary to treat with the Bailie. He was not unapproachable, seeing that he had suffered this going and coming from the town to the camp and the camp to the town; and with him must be devised some honest means of getting rid of the garrison. With this object the commonalty, preceded by the Lord Bishop, went in great numbers to the Bailie and the Captains, and called upon them to provide for the safety of the town. This demand they were incapable of granting, for to safeguard a city against its will and to drive out thirty thousand French was beyond their power. As the townsfolk had anticipated, the Bailie was greatly embarrassed. Beholding his perplexity, the Councillors of the town said to him, "If you will not keep the treaty you have made for the public weal, then will we bring the King's men into the city, whether you will or no." The Bailie and the Captains refused to betray their English and Burgundian masters, but they consented to go. That was all that was required of them. The town opened its gates to Charles. On Sunday, the 10th of July, very early in the morning, the[Pg i.432] Maid entered first into Troyes and with her the common folk whom she so dearly loved. Friar Richard accompanied her. She posted archers along the streets which the procession was to follow, so that the King of France should pass through the town between a double row of those foot soldiers of his army who had so nobly aided him. While Charles of Valois was entering by one gate, the Burgundian garrison was going out by the other. As had been agreed, the men of King Henry and Duke Philip bore away their arms and other possessions. Now, in their possessions they included such French prisoners as they were holding to ransom. And, according to the use and custom of war, it would seem that they were not altogether wrong; but pitiful it was to see King Charles's men led away captive just as their lord was arriving. The Maid heard of it, and her kind heart was touched. She hurried to the gate of the town, where with arms and baggage the fighting men were assembled. She found there the lords of Rochefort and Philibert de Moslant. She challenged them and called to them to leave the Dauphin's men. But the Captains thought otherwise. "Thus to proceed against the treaty is fraudulent and wicked," they said to her. Meanwhile the prisoners on their knees were entreating the Saint to keep them. "In God's name," she cried, "they shall not go." During this altercation there was standing apart a certain Burgundian squire, and through his mind were passing concerning the Maid of the Armagnacs cer[Pg i.433]tain reflections to which he was to give utterance later. "By my faith," he was thinking, "it is the simplest creature that ever I saw. There is neither rhyme nor reason in her, no more than in the greatest stupid. To so valiant a woman as Madame d'Or, I will not compare her, and the Burgundians do but jest when they appear afraid of her." To taste the full flavour of this joke it must be explained that Madame d'Or, about as high as one's boot, held the office of fool to my Lord Philip. The Maid failed to come to an understanding with the Lords de Rochefort and de Moslant concerning the prisoners. They had right on their side. She had only the promptings of her kind heart. This discussion afforded great entertainment to the men-at-arms of both parties. When King Charles was informed of it, he smiled and said that to settle the dispute he would pay the prisoners' ransom, which was fixed at one silver mark per head. On receiving this sum the Burgundians extolled the generosity of the King of France. On that same Sunday, about nine o'clock in the morning, King Charles entered the city. He had put on his festive robes, gleaming with velvet, with gold, and with precious stones. The Duke of Alençon and the Maid, holding her banner in her hand, rode at his side. He was followed by all the knighthood. The townsfolk lit bonfires and danced in[Pg i.434] rings. The little children cried, "Noël!" Friar Richard preached. The Maid prayed in the churches. In one church she held a babe over the baptismal font. Like a princess or a holy woman, she was frequently asked to be godmother to children she did not know and was never to see again. She generally named the children Charles in honour of the King, and to the girls she gave her own name of Jeanne. Sometimes she called the children by names chosen by their mothers. On the morrow, the 11th of July, the army, which had remained outside the walls, under the command of Messire Ambroise de Loré, passed through the town. The entrance of men-at-arms was a scourge, of which the citizens were as much afraid as of the Black Death. King Charles, being careful to spare the citizens, took measures to control this scourge. By his command the heralds cried that under pain of hanging no soldier must enter the houses or take anything against the will of the townsfolk.